Hello! I took an unexpected break from the blog and sewing (I haven’t sewed a stitch in over two weeks – yikes)! It’s officially back to school time over here and that is one of the busiest times of the year for me. I’m itching to get back to sewing and blogging (I have sooo many projects lined up), but it might be another week or so before I get my head back above water. How about you? Is this a crazy time of the year? Head over there to get a peek at my sewing/crafting space and find out what I consider to be my best sewing friends . . . I certainly couldn’t do it without them!! While you’re over there, you should also check out the guests they’ve already had and continue checking back over the next couple of weeks for some fantastic bloggers sharing about their best friends every few days. I also just wanted to take a moment to thank all of you readers for always supporting me and giving me inspiration! You make blogging so much fun! I’ll be back as soon as possible to share some fun stuff I’ve been working on and some of the things I’ve got on my to do list. Thanks for stopping by! Happy sewing! This entry was posted in guest post and tagged craft center, guest post, My Best Friend, Sew Together, sewing area by Cherie. Bookmark the permalink. i loved reading your post! you are a very lucky and talented lady! love your post! So heart warming! I also love your blog and your creations:) If you get the chance, check out my blog. I’m a fellow sewer and fashion design student! 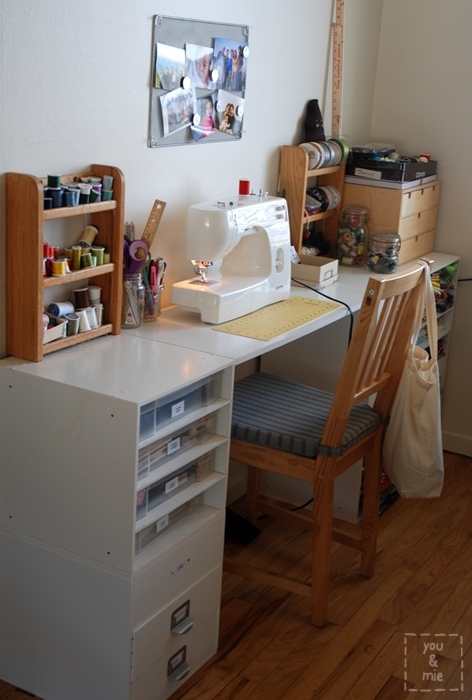 That’s a lovely sewing area you have – so neat! Great blog.